The Big West Conference Tournament is next week. Before the University of Hawai’i basketball team can look to that, it will try to regain momentum and extract a little revenge in the regular-season finale at Cal State Fullerton. 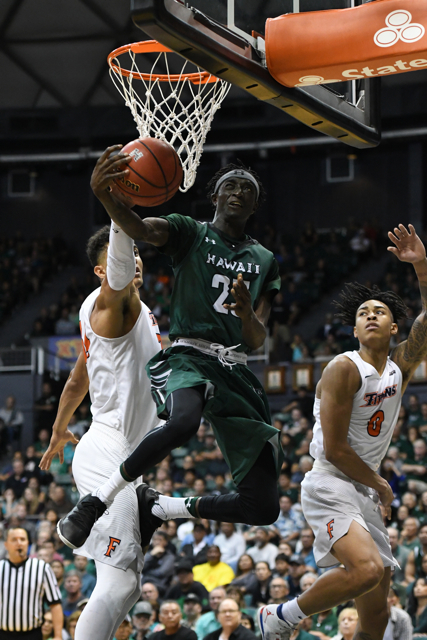 The Rainbow Warriors will look to end a two-game losing streak on Saturday, when it plays the Titans at Fullerton, Calif. The game is scheduled to start at 1:00 p.m. (Hawai’i time) at Titan Gym, and will be televised nationally on Fox Prime Ticket. 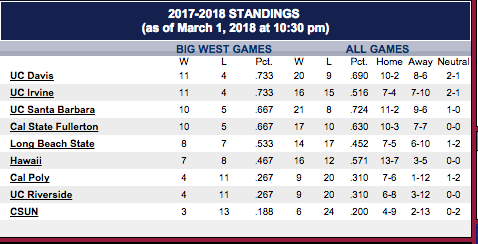 Hawai’i is 16-12 overall and in sixth place in the Big West at 7-8. Cal State Fullerton is 17-10 overall and tied for third at 10-5. The Warriors will end up as either the No. 5 or No. 6 seed, pending Saturday’s outcomes (other games will also factor in) for the Big West Tournament. The Titans can finish No. 2, 3 or 4. Several scenarios have the Warriors and Titans facing each other again in the quarterfinals of the tournament. Regardless of next week’s scenarios, the Warriors will need to fix their recent offensive woes. 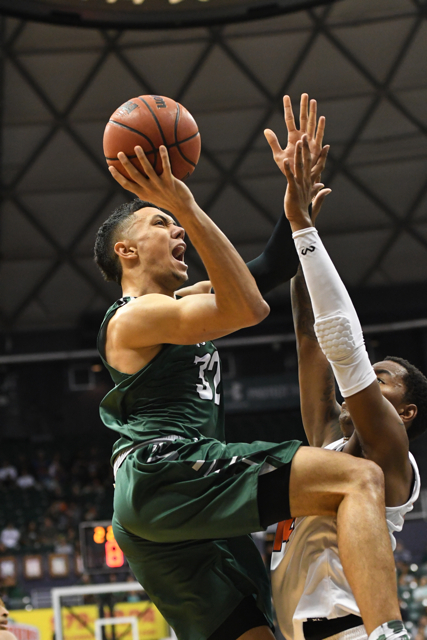 In the last two games, Hawai’i is averaging 58.0 points per game while shooting 37 percent from the field, 29.3 percent from 3-point range, and 68.2 percent on free throws. On Thursday, the Warriors trailed from start to finish in a 70-59 loss at UC Davis. The Titans have won two in a row, including a 102-76 rout of CSUN on Wednesday. Which leads to the matter of the Cal State Fullerton offense. The Titans average 74.4 points per game, and lead the Big West with a .474 field goal percentage. Most notable, the Titans shot 61.4 percent from the field in a 69-66 win at Hawai’i on January 27. It helped Fullerton’s cause to have Kyle Allman Jr. play the best game of his career that night. The 6-foot-3 junior guard scored 40 points, and shot 16 for 19 from the field, including 5 of 6 from 3-point range. Allman is the current leader in the chase for the Big West scoring title. He is averaging 19.5 points per game overall, and 21.8 per game in Big West contests. UC Santa Barbara’s Max Heidegger is second overall at 19.3 per game, and Long Beach State’s Gabe Levin is also averaging 21.8 per game in Big West contests. The Titans have other offensive weapons they can turn to. Junior guard Khalil Ahmad is averaging 15.6 points per game, and leads the team with 51 3-pointers. Sophomore forward Jackson Rowe is averaging 12.0 points and 6.8 rebounds per game and is shooting 57.9 percent from the field. The Warriors are led by senior forward Mike Thomas, who is averaging 13.2 points and 6.0 rebounds per game, and shooting 57.0 percent from the field. He had one of his better games of the season in the first meeting with Cal State Fullerton, tallying 26 points on 9-of-14 shooting overall, 2 for 2 from 3-point range, 4 for 4 on free throws, and six rebounds. Junior guard Sheriff Drammeh is averaging 11.2 points per game, and will have to play a key defensive role against the Fullerton guard tandem of Allman and Ahmad. Senior forward/center Gibson Johnson is averaging 9.8 points and 4.7 rebounds per game, and junior guard Brocke Stepteau is contributing 9.6 points per game. Freshman point guard Drew Buggs is averaging 7.9 points, 3.7 rebounds and 3.6 assists per game, but he sat out the entire second half of the loss at UC Davis on Wednesday with a hand/wrist injury. Saint Mary’s will not participate in the 2018 Hawaiian Airlines Diamond Head Classic due to a scheduling conflict, and will be replaced in the eight-team field by Bucknell. The change was announced on Friday. Bucknell is considered the top team in the Patriot League, and the Bison recently clinched their fourth consecutive regular-season conference championship. The 2018 Diamond Head Clasic field now features: Bucknell (Patriot League), Charlotte (Conference USA), Colorado (Pac-12), Indiana State (Missouri Valley), Rhode Island (Atlantic-10), TCU (Big 12), UNLV (Mountain West), and the host Hawai’i (Big West). The tournament will be played December 22, 23 and 25 at the Stan Sheriff Center. Where: Titan Gym (4,000) – Fullerton, Calif.
A let’s go Bows!!! Take it to them! !